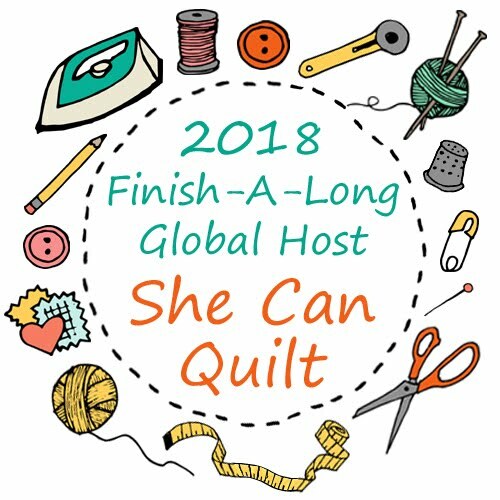 she can quilt: Nordika Giant Plus - Ta Da! This is my Nordika Giant Plus. She was made with Kona white and a set of fat quarters from the Nordika fabric line. I finished her a while ago now, at the beginning of March but somehow I kept putting off showing her off here. These first pictures are after a wash and dry. One of my worries getting the long arm machine was that the detailed quilting would disappear into the after washing bumps. I am so pleased to see that it does not do that. This quilt was the first one I quilted with my own new long arm. She is a sampler of quilting patterns I know or wanted to try. I learned that I am better at some designs than others. I am totally sold on wavy lines as a quick and easy filler for backgrounds. You are going to see them on a lot of my quilts. I so pleased that the quilting shows so well on the tea dyed text print on the back. It also shows up nicely when the quilt is being held up. These next photos are before washing. The quilt is "flatter" and more cardboard like but you can certainly see the quilting better. 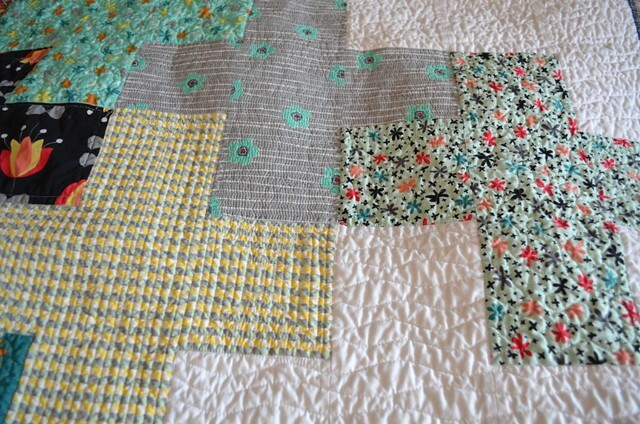 I really like that double loopy loop, and of course the dense matchsticking quilting in the grey plus. That is supposed to be flowers in the black background flowers. That design needs work. 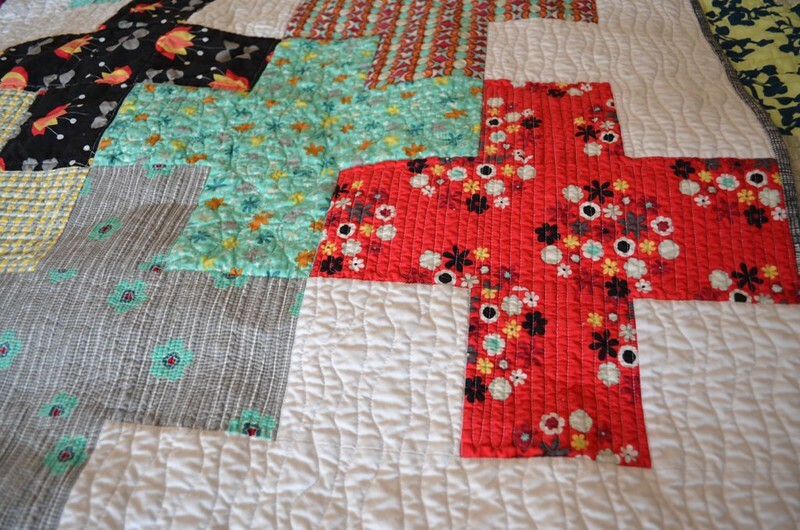 It will be a while yet before I tire of showing off my beginning quilting. I hope you don't mind. The square stipple is another favourite of mine. And one last photo after the wash. These were taken a few weeks ago, we have less snow on the ground today. I am still planning to make a pattern for my version of this simple quilt, I really like the layout where you don't fill in all the pluses. 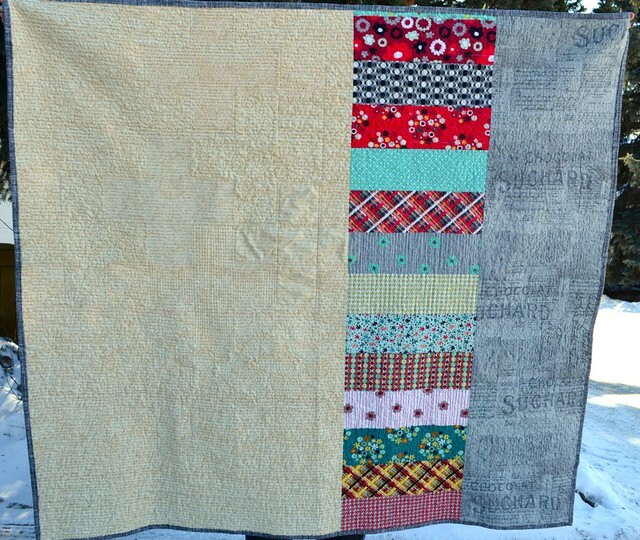 This quilt is my fourth finish from my Q1 FAL list (which is here). I hope you are getting your last finishes in too - I can't believe that March is just about done, it will be spring soon. 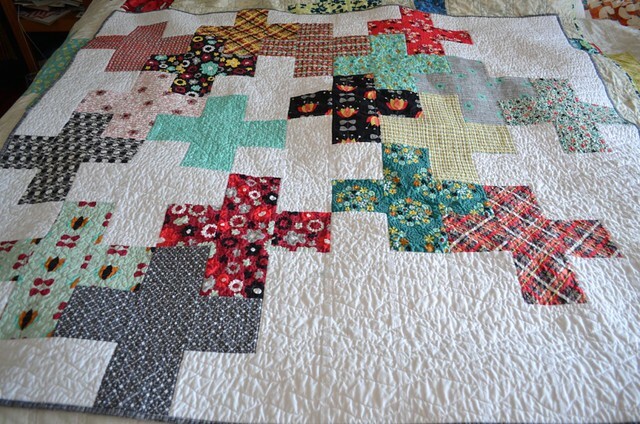 Good idea to try out several quilting patterns.....it looks fabulous!!! Such a great pattern! 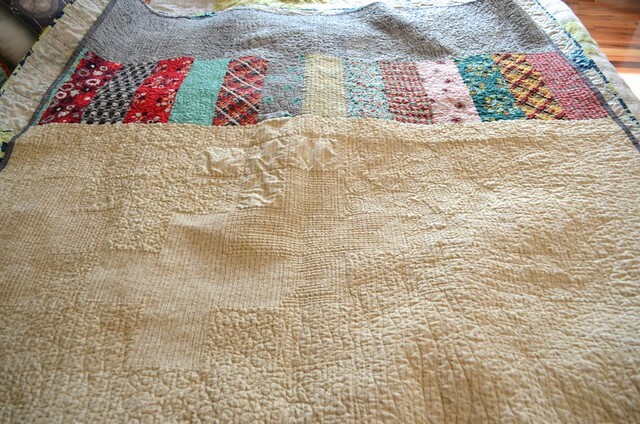 I love that you did different quilting in each area. You are really getting good with the new longarm. Oh man I love this quilt! Nordika is a favourite and so is the plus block. Double whammy !! 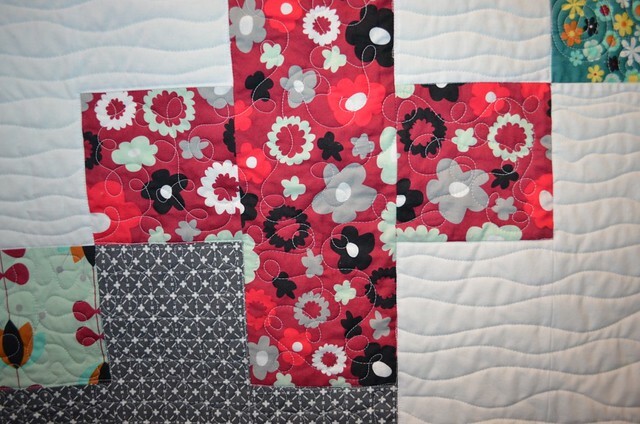 I was thinking how much I love this more sparse placement of the crosses that I would LOVE the pattern! It's very effective and not nearly as busy as the traditional version! And you are becoming quite the long arm quilter too! Great job, great finish! It is fabulous Leanne. 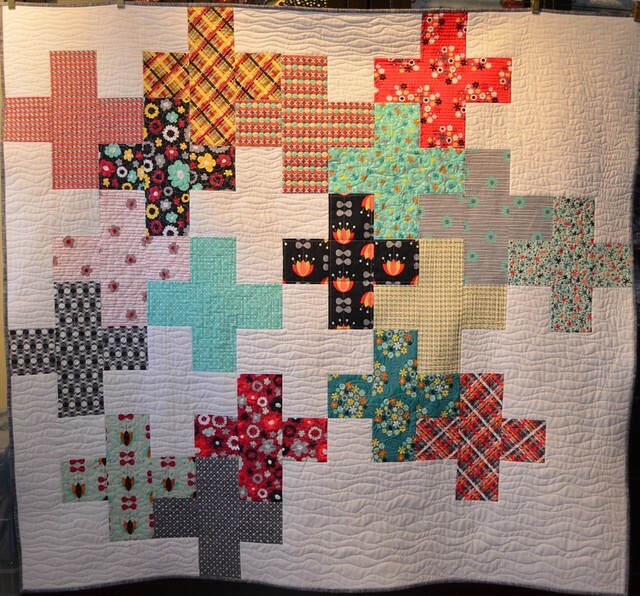 I love the empty crosses too, and the quilting looks wonderful. I'm really enjoying seeing what you can do on your longarm. Very nice Leanne....I enjoyed the quilting patterns you used. It really is great and I love your quilting. For a new longarm quilter I think you are doing really well. 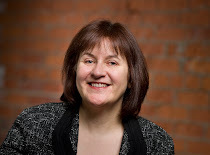 Leanne, I love the white crosses interspersed among the beautiful prints. This is a great inspiration. 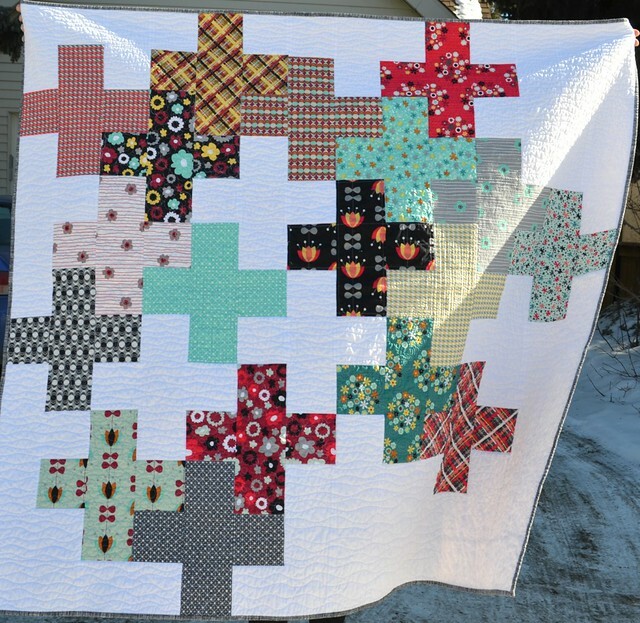 I've been wanting to make a plus (cross) quilt and I really adore this one. 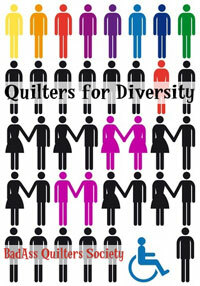 Thanks for sharing this and the great, great quilting on your long arm. SPLENDID quilt! Your machine work is very nice - you make me want to try it. So much fun seeing your initial forays with the new longarm! Very nice -- and instructive, too! This is a beautiful ta dah! That double loopy pattern is one I'm looking at for my Swoon! Love the differences in texture and how beautifully the plus shapes appear on the back. Gorgeous finish! Stunning quilt, fabulous quilting too! I really must make a plus quilt! 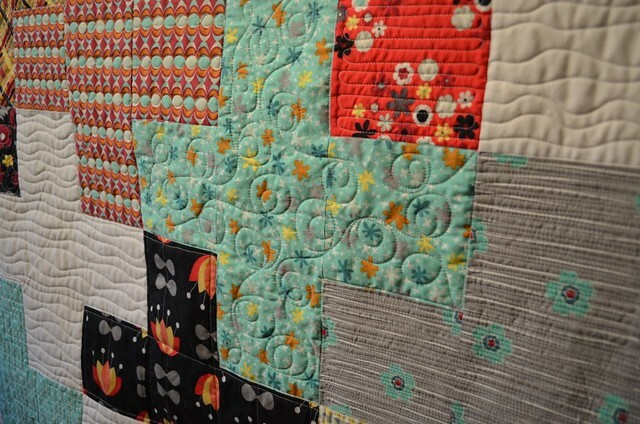 Love all that quilting! I haven't tried a square stipple yet...I have issues with keeping lines straight and corners unrounded. Maybe with a little more experience I will feel ready to try that one. 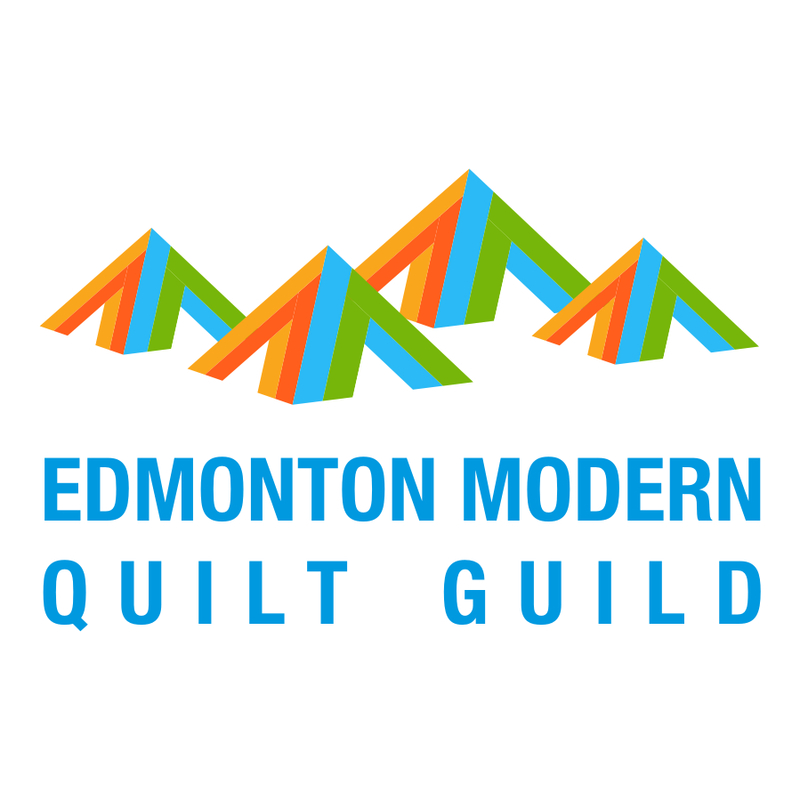 What are your square sizes and the finish quilt size? I have 39 FQs and 10 half yards (so 59 FQs total...may get more) of solids to make a plus quilt (starting to cut it tomorrow) and I'm trying to decide on my block sizes. I want it to be king sized. I've seen every where from 3-6 inch finished squares. My patterns may decide as I want to fussy cut some! I love it, Leanne! I agree with Janet - the negative pluses, the fact that this is a sampler of quilting stitches...the fabrics, love it all. I think I like the back best because it shows off all that amazing quilting! Have you thought of doing a whole cloth? gorgeous quilt Leanne, as usual. 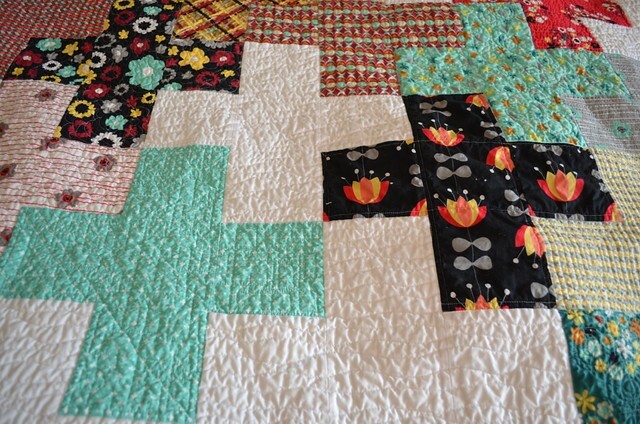 I love all the amazing quilting you did on it, so very perfect!!!! I too really like the layout where you don't fill in all the pluses so I'm looking forward to your tutorial on this quilt. Very nice work, Leanne. Beautiful! 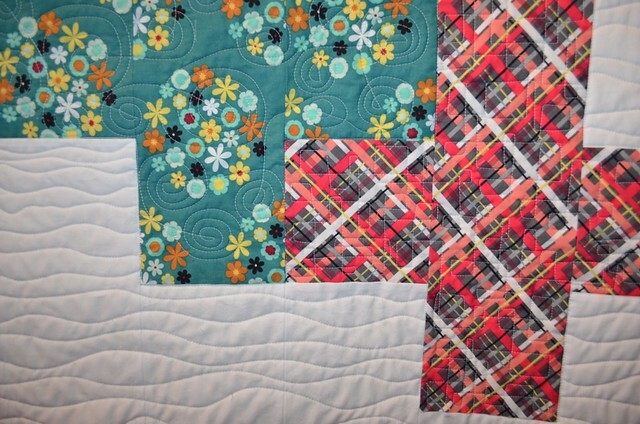 Glad you are a convert to the wavy lines - as you know I love them because they are easy to achieve on my small machine with my limited quilting repertoire! I do think they look good though. 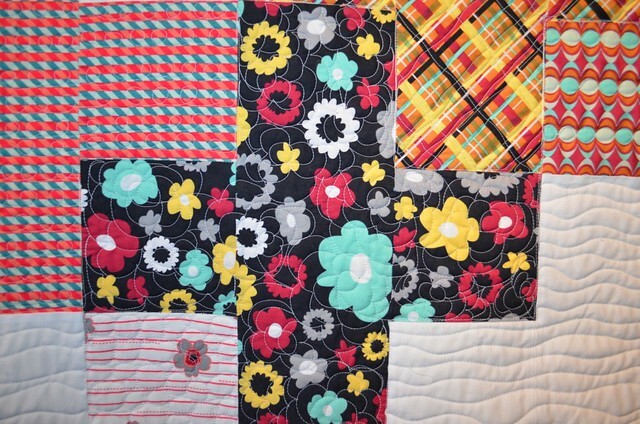 I love all that quilting!! I really enjoy your quilts. I want to make one for a wedding gift and I was wondering how large your squares are in this? Thank you for the inspiration you give to me and obviously many others! 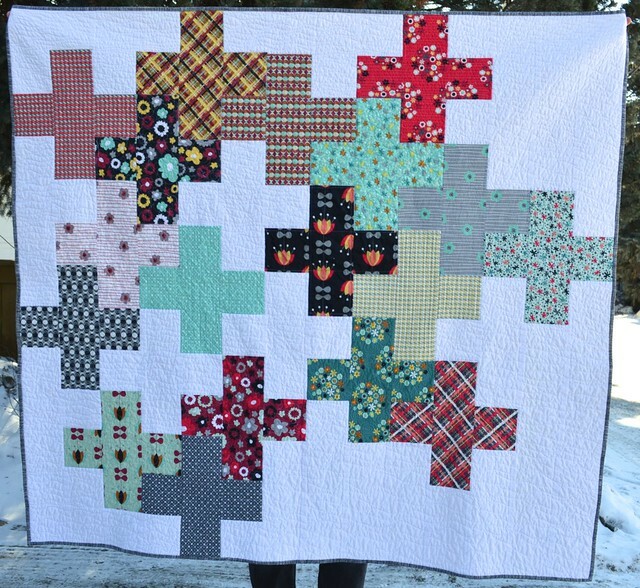 I love this quilt Leanne! I really like how your pluses are huge.